American Energy Society selects Nathaniel Rich as “Energy Writer of the Year, 2018"
The premier literary award for the energy sector. 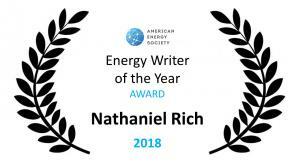 PALO ALTO, CALIFORNIA, UNITED STATES, December 4, 2018 /EINPresswire.com/ — Palo Alto, Calif. – December 4, 2018 – American Energy Society is pleased to announce that it has selected Nathaniel Rich as the "Energy Writer of the Year, 2018." The Society took special note of his article, “Losing Earth: The Decade We Almost Stopped Climate Change” (New York Times Magazine, August 1, 2018). The 31,000-word piece weaves together a narrative about a critical ten-year period, 1979 to 1989, when science, politics and industry awoke to the fact that rising greenhouse gases posed an existential threat. Rich documents how and why this great awakening failed to translate to action despite universal and bipartisan acceptance of the problem. Accompanying aerial photographs and videos by George Steinmetz supports the thesis with a vivid display of disturbing images. Tucked into a prodigious amount of material is the story of the key figures who turned climate change into a major political issue. In the late 1970s, few Washington officials knew much of anything about global warming; by the end of the ‘80s, President George H.W. Bush almost signed a United Nations treaty to address it. Mr. Rich writes with gripping, novelistic detail and captures the tragicomedy of scientists struggling — and failing — to shape the political sphere. Perhaps it is most apt to compare the present existential crisis documented by Mr. Rich to Thomas Jefferson’s equally upsetting remark about slavery, one of humanity’s first great crimes: “as it is, we have the wolf by the ear, and we can neither hold him, nor safely let him go.” Mr. Rich is telling us that perhaps it is time to start thinking about the prospect of letting go. 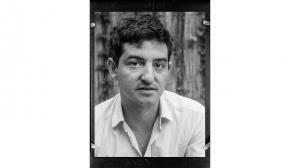 About Nathaniel Rich: An alumnus of Yale University, where he studied literature, Mr. Rich is the author of many essays for Vanity Fair, Harper's Magazine, Rolling Stone, and Slate, as well as novels such as Odds Against Tomorrow (2013) and non-fiction books like San Francisco Noir, named one of the best books of 2005 by the San Francisco Chronicle. – 2017: Meghan O’Sullivan, Windfall: How the New Energy Abundance Upends Global Politics and Strengthens America's Power. – 2016: Mark Mills: “Shale 2.0”. – 2015: Coral Davenport, New York Times. About the Society: The American Energy Society (AES) is a non-partisan, energy-neutral, independent network of nearly 500,000 professionals from every energy sector. Through a variety of services and programs, the AES supports its Members with recognized publications like Energy Today and Energy Matters, a website newsfeed dedicated to the “energy news you need to know today,” updates on groundbreaking discoveries, and notifications about upcoming conferences, funding and awards, job openings, and more. To learn more about AES, visit www.energysociety.org. Credentialed media can contact AES for more information about this award. The American Energy Society, an introduction.